Tricia's husband Daniel has been missing for seven years and pressure mounts to declare him "dead in absentia." As Tricia tries to move on with her life, her sister Callie finds that an ominous tunnel near the house is linked to other mysterious disappearances and Daniel's presumed death might be anything but "natural." From writer/director Mike Flanagan (The Haunting of Hill House). 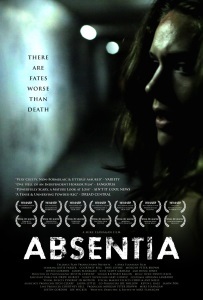 I liked this creepy little movie, though it is thin, slow, and shabby. It feels like the palpable nothingness of depression: not having any the better, dramatic interesting lives one could imagine, no excuse or explanation for the nothingness that is there instead, for letting down your loved ones. I saw this awhile ago and was trying to remember it. I thought the ending was the sister tries to make a trade, her life for her sister's, but the tunnel monster plays a grotesque trick and trades her for the fetus. I wasn't sure though -- I just rewatched the ending and maybe that's what goes on but I didn't see any part where they establish it's going to be a traide, so now I'm not sure if I remembered right. I really appreciated that there wasn't some sort of unearned happy ending. It would have been so easy for them to have one of the characters figure out a way to bring everyone back, to fight back against the entity... But that didn't happen. In all the lead-up, there were no clues about how to defeat this thing or what could lead to getting people back from it, and... That's how it ended. That was successfully creepy for me, particularly because of how it defied my expectations. I thought the ending was the sister tries to make a trade, her life for her sister's, but the tunnel monster plays a grotesque trick and trades her for the fetus. I wasn't sure though -- I just rewatched the ending and maybe that's what goes on but I didn't see any part where they establish it's going to be a traide, so now I'm not sure if I remembered right. I usually watch everything with subtitles, and the subtitles are that she's saying "Trey" which I thought might be her sister's nickname. But it does sound like "trade" the way she is saying it, so that seems right. I don't think I was watching everything with subtitles turned on, so that might explain my confusion.